This is what inspiring education looks like. 1) We were treated like royalty, from beginning to end. 2) The students get to walk from school to the nearby vineyard and learn how to take care of one of their community’s most valued natural resources, the rare Takao grapes. The community liaison teaches 3rd graders about how to protect the grapes from disease. The students listen to their lesson. Kids help to put little paper umbrellas around the special Takao grapes. Students learned about a creature that eats the grapes, and performed a play about whether or not he is a cute friend or an enemy. A mural at the school shows what the students are working on with the grapes. 3) Students get to share their opinions about what needs to be protected and fixed in their community, and they even use some systems thinking mapping! Students share their perspectives about the problems they see in their community. If you are a student or teacher at IACS, doesn’t this look like a systems thinking mapping tool? 4) Students learn about how rice is grown and get to help out in a real way, through both classroom work and getting out into their community to see the theories in action. Students made posters with photos from the rice fields. 5) Students are working to preserve cultural identities as well as the environment. They learn about the traditional Japanese tea ceremony from the masters, and then get to practice the different steps. Students learned the steps of a Japanese Tea Ceremony, and then they got to practice on our group. A student receives the tea to give to us. The tea was very bitter and thick, but still tasted like green tea. All in all, it was a pretty special experience, and I finally feel that I saw “Education for Sustainable Development” in action in a very full way. The students at this school were truly immersed in the community engaging in real work that matters. We (the American teachers) all remarked that we can’t possibly give back enough to thank these schools for hosting us. We are sharing our talents and greetings from our schools one little bit at a time.Today, I shared some of my students’ art, gave a talk and showed a video of Innovation Academy, did some balloon twisting, and answered the questions of Japanese students. Other teachers in our program taught the Star Spangled Banner, gave a beautiful mural, and shared their other unique talents. Abigail showed a fabulous slideshow about her work with her students back home in Maryland. Rob uses the SMART board to show students where he lives near the Mexico border. Brad shared this stunning mural made by students at his school in Chicago. Tomorrow we leave for our host cities, and I’ll be heading to Kushiro, on the Northern island of Hokkaido. We are all thinking more about all the possibilities and growth that is possible with some international collaboration. It’s all going to start with the personal connection. That moment today when I walked down to the vineyard holding the hand of an adorable little 8 year old girl who was too shy to say much in English but told me that she liked cake. This wasn’t a day that any of us will forget any time soon. 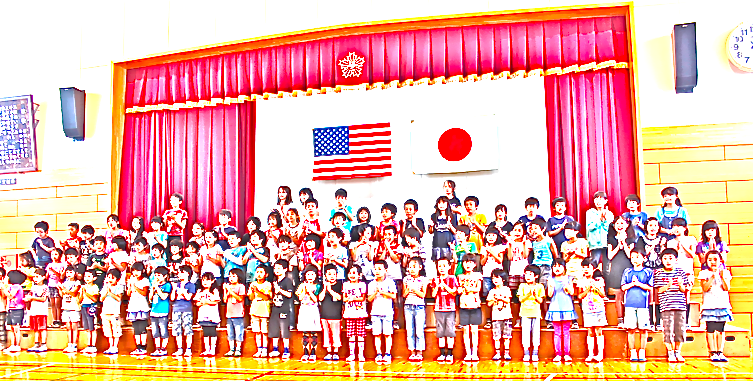 Thank you to everyone at Inagi Daini Elementary School! 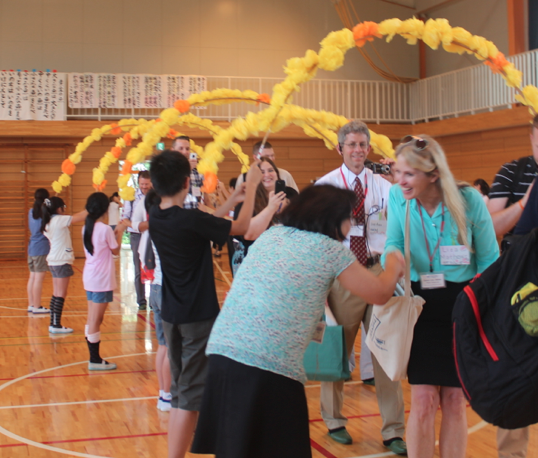 I noticed that Inagi Daini Elementary School is helping each other out and working together as a community. The things they do, how does it help and affect the community? Great questions, Erin. They actually work on the farms, learning how to care for the grapes and rice, for example. So, it is real work that helps the plants grow and makes money for the community! But more importantly, they are learning how to do these things and why it matters, so that when they grow up they can keep fighting for sustainable farming practices and caring for their land. Watching the 3rd graders, I could see how carefully they touch the plants — they were very gentle and respectful — much more than American kids would be, I think. They are learning how to care for their environment. Not just in theory, but in practice! I’m impressed with how students are immersing themselves into everything they learn! They participate in so many hands-on activities! Do you have any ideas for IACS, Ms. Krakauer? I also learned about the tea ceremony in 8th grade. Based on what you’ve seen the students do, has/do you think the Japanese tea ceremony has changed throughout the years? Why/why not? Can’t wait to hear about Kushiro! What an inspiring experience! Thanks for sharing with us! 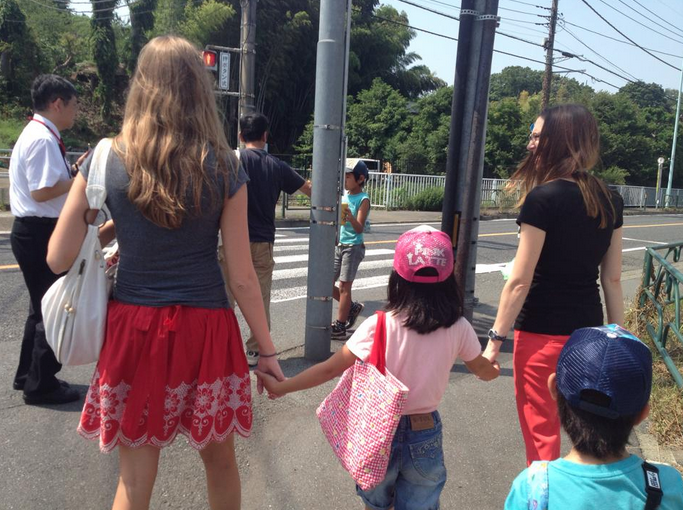 Will you be bringing anything back from Japan for your students? It’s neat how these kids learn how to grow food and be a part of their community. I would love to learn how to grow food too!